Unfortunately, however, far too many restaurant employees, part-time salespeople, manicurists, and other hard-working, low-income New Yorkers who are intended to benefit just haven’t, even long after reforms have gone into effect. There are many reasons why: Workers don’t know they’re covered by the new laws; or they may be understandably reluctant to call out bosses who aren’t in compliance; or, in the case of the minimum wage, the complex structure of the law itself may be getting in the way. Paid Sick Leave: There’s clearly been major progress in this area. Four years ago, just 47% of low-income workers had paid sick leave; today 71% do. But there are also big gaps. For example, while the City paid sick leave law covers part-time workers in businesses with five or more employees, nearly half of these covered workers say they don’t receive paid sick leave. 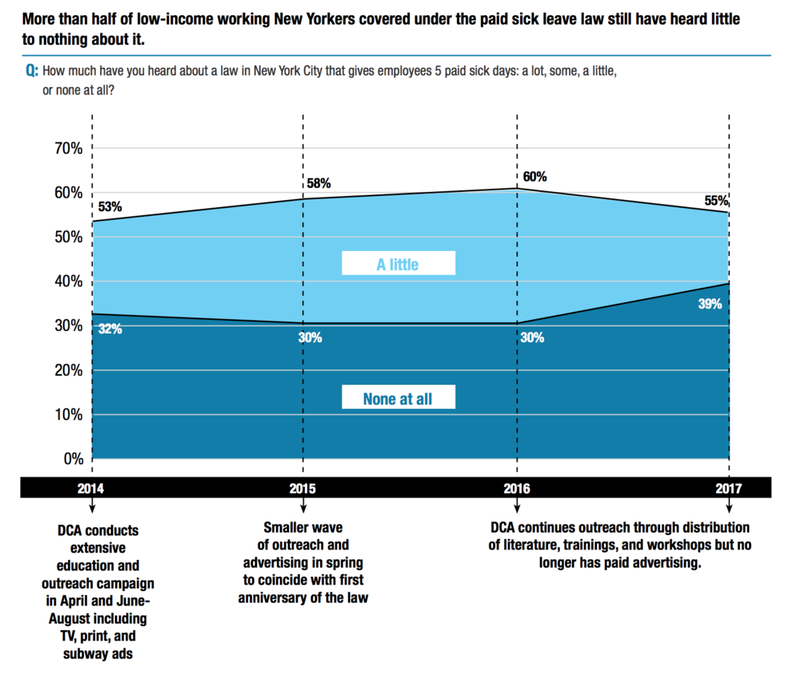 Despite public education and outreach efforts by the City’s Department of Consumer Affairs (DCA), more than half of all covered full- and part-time workers also reported knowing little or nothing about the law’s benefits. That’s a huge barrier to realizing the full promise of this humane and cost-effective reform. Minimum Wage: Most low-income New Yorkers know that the minimum wage has gone up. But we bet they, and their supervisors, would be hard-pressed to say what exactly the minimum wage now is in New York City. That’s because wage requirements differ for fast food, tipped, and general workers, and phase in on different schedules depending on employer size and location. Such complexity makes for confusion; it also creates an environment where wage theft can flourish. Based on an analysis of recent Census Bureau data, CSS conservatively estimates that 34.4% percent of low-wage hourly workers in New York City reported wages below the applicable minimum wage. Paid Family Leave: The “Unheard Third” survey took place a year after the new State law on family leave passed, but before it went into effect. And it shows just how much education and outreach will be needed to make sure the law’s benefits are fully enjoyed; 71% of low-income workers had heard little or nothing about the new law. Much of the enforcement of these labor standards is complaint-driven. That approach has limits, particularly in protecting vulnerable low-wage, non-unionized, and immigrant workers who are understandably fearful of speaking out on the job, or of lodging complaints with government agencies. Although both New York City and State have initiated proactive investigations of industries known to have widespread wage and labor standards violations, the challenge is enormous. With thousands of small establishments, with domestic workers isolated in private homes, and with laborers scattered across small and changing worksites, much remains to be done. There are remedies – some simple and direct, others more far-reaching. Outreach to low-income workers should be institutionalized and better targeted. For example, health insurance claims submitted for a prenatal visit under Medicaid should automatically trigger a notice, text message, or both to the patient informing her about paid family leave. Other insurers should be encouraged or required to do the same. In a similar vein, CSS and the New York Paid Leave Coalition are preparing to collaborate with the prenatal clinic at Bellevue Hospital Center to provide information about paid family leave to pregnant women there. Posters about the right to paid sick leave should also go up at pharmacies, clinics, and in doctors’ offices. We should also better align and simplify minimum wages so that particular groups or sectors aren’t left behind, while making the actual minimum wage easier to communicate and grasp. Simplicity aids enforcement and discourages wage theft. Eliminating the separate, lower minimum wage for tipped workers – an idea Governor Andrew Cuomo is considering – would be a good first step. Beyond that, elected officials, non-profit funders, and social justice advocates need to acknowledge just what a long, hard task ensuring fairness and dignity in the workplace is. (They also must recognize how important unions and other labor organizations are in protecting workers’ rights.) Passing a new law is heady stuff; following up to see what happens next can seem less exciting. But for ordinary workers to benefit from measures that the majority of New Yorkers clearly support – for the new wave of labor reforms to become actual workplace norms – there’s simply no substitute for outreach, advocacy, and enforcement over the long haul. Nancy Rankin is vice-president for policy research and advocacy for the Community Service Society of New York (CSS). Irene Lew is a CSS policy analyst. Both acknowledge the work of CSS senior labor economist Harold Stolper in calculating the dimensions of potential wage theft.